Stray thoughts, notes, and digressive ditties. I have not been very consistent this year about writing in this blog, despite my resolution last year. After a flurry of posts in January (Flattery at the Money Cage, Stalin as Reviewer #2, Democracy Data, Updated, and Charisma and Representation), I only wrote one other thing - my piece Against Renaming Victoria. (About which - the no change position won, at least for now; and I’m proud to have been an early participant in the “stick with Vic” campaign). The “Charisma and Representation” piece was the most popular of these posts; and I’m currently working on a more academic version of the arguments there. Thank you all for reading! I also published a paper of potential interest to this blog’s readership: “Two Models of Political Leader Cults: Propaganda and Ritual” (ungated version here); but my other research projects took a bit of a beating at the hands of increased administrative responsibilities. (Still, more is coming - and perhaps will be previewed in this blog if I can find the time next year). Possibly the best book I read (or rather, finished reading) this year was Yuri Slezkine’s The House of Government. It’s not an easy book – it’s more like 3 or 4 books in one, including an essay about the Bolsheviks as a millenarian sect, an interpretation of pre-WWII Soviet literature, a history of the private lives of the residents of the “House on the Embankment” told through their letters and personal reminiscences, and a tribute to Yuri Trifonov’s work – but for readers with some background about the history of the period the overall effect is magnificent. I’ve been mulling over writing a long post about it, which will probably never get written. Slezkine’s work also led me to read some of Trifonov’s novels – The House on the Embankment and Another Life, both of which I found powerfully moving in their reflections about memory and identity. I also finally read The Master and Margarita, a book that I finally feel I understand a bit. (I had tried reading it years ago, and never got past about the halfway point). Lots more “serious” literature this year than last! Perhaps I enjoyed these now only because I could understand some of their background better; and yet I still feel like I barely know anything about Soviet society. (This is how historians must feel all the time). I finally took a crack at Leszek Kolakowski’s Main Currents of Marxism; I found volume I really useful in thinking about what was utopian in the communist projects of the 20th century. (And the fact that I had to give a public lecture on Marx spurred me to actually read it). Lest you think I actually have any taste, I also read I lot of sci-fi. I enjoyed Ada Palmer’s Terra Ignota series, though I thought the third volume flagged a little. And I always enjoy anything by Charles Stross - this year’s Dark State and The Labyrinth Index were great fun. (I’m a fan of the Cthulhu+bureaucracy genre that Stross has perfected). Ribbonfarm always gets a mention here (because I like it), and this year is no exception. I love Sarah Perry’s essays - this year I especially liked Metaphor Therapy, Treasure Hunting, Social Media Consciousness, Deep Laziness, and perhaps most of all Luxuriating in Privacy. Somewhat idiosyncratically related: Agnes Callard’s beautiful essay on Unruliness. This year I spent a lot of time on Gwern’s site; I really enjoyed his extraordinarlily thorough exploration of My Little Pony fandoms, but there’s lots and lots there worth reading. (I expect most people reading this already read Gwern, but it’s only recently that I delved into his site). Also idiosyncratically related: this totally different essay in Commune on Ursula LeGuin’s “Hainish” novels, Communism Might Last a Million Years. (I think both My Little Pony and LeGuin’s novels have to do with utopia, but don’t ask me to articulate the connection right now). Cosma Shalizi had some great new posts, after a while of not posting anything: a reading of Marx’s Capital, Practical Peer review (I’ve used this with my PhD students). This year I’ve tried to add some art to my twitter feed, and I’ve really enjoyed @inconvergent’s procedurally generated pieces (follow him here). I’ve also enjoyed the algorithmic and conceptual weirdness catalogued in Esoteric.Codes (not on twitter). Some other random pieces worth mentioning: Perry Anderson on Anthony Powell; The Endless Reign of Rupert Murdoch (much more than you ever wanted to know about Rupert Murdoch, but also a brilliant sociology of the newspaper industry); Interfluidity on Authority; Andrew Batson on A Weberian Analysis of Xi Jinping’s Authority (also read his blog more generally, e.g this); Justin Smith on Cave Art; Welcome to Armaggedon. And for the extremophiles fans, there was this nice NYT piece recently about microbes 3 miles under the crust. As usual, there’s a lot more worth sharing, but this is probably enough for now. Happy summer solstice / winter solstice / Christmas / Festivus / Yule / Newtonmass / Toxcatl to all! The Vice-Chancellor of Victoria University of Wellington, where I work, recently proposed to simplify the name of the institution to “University of Wellington” or “Wellington University.” Professor Guilford, the VC, argues that Vic’s name is easily confused with the many other universities around the world that include the word “Victoria”, and that a name change would be beneficial to the prestige of the University, allowing us to rise in the rankings. He builds his case carefully and addresses many possible objections fairly; I was impressed by his presentation. Moreover, one must grant that he has made a genuine effort to consult with students, faculty, and alumni, taking their views seriously. The proposed “name simplification” is not particularly objectionable in itself; no one is suggesting we become the Charles G. Koch University of Wellington or the Wellington People’s Friendship University. The VC also seems to envision the name change process as a sort of gradual retreat from, or a controlled forgetting of, “Victoria” (changing things a little bit at a time, via the normal maintenance budget? ), obviating any objections based merely on the potential cost of the name change; no multi-million dollar “rebranding” campaign seems to be planned. Yet I still find myself opposed to this proposal; and I thought it would be good to articulate why here, in part because some of my reasons concern themes I have sometimes explored in this blog, and may therefore be of some slight interest to people not connected to Vic. It may be objected at this point that Cohen’s claim is inapplicable to this name simplification proposal. Changing the name of the University hardly amounts to destroying the institution! Moreover, the kind of change envisioned does not appear to trigger standard conservative considerations about unintended consequences and the difficulties of changing complex systems (about which I’ve written here). But a name is not nothing either; and for long-standing institutions, it seems to me, there are good reasons for leaving names as they are, since they come to summarize and even embody the stories that tie people to them. Let me try to articulate these reasons further. According to the University’s website, Victoria got its name as a result of the parliamentary skills of Premier Richard Seddon. In 1897 Seddon proposed the creation of “Victoria University College”. This was not the first choice of the other proponents of a University in Wellington (e.g., Sir Robert Stout); but it was accepted because it was the Diamond Jubilee of Queen Victoria and the House was “loath to disagree” with Seddon’s proposal. (It looked bad to intentionally go out of your way not to honor the reigning monarch). At least that’s what the Vic website says; a quick skim of the relevant pages of Hansard and of Rachel Barrowman’s history of the University suggests the disagreement seems to have been less about the name of the University than about the specific form the new college would take. But Seddon did use the occasion of Victoria’s jubilee to break the deadlock in a debate over whether to fund a college that had been going on, inconclusively, for about two decades. Wellingtonians were pretty commercial-minded in the late 19th century, and many didn’t think this would be a good use of public funds; but Seddon successfully argued that the establishment of a University would be “a fitting way for the colony to mark the Queen’s jubilee year”. The historian John Plunkett has argued that the “cult” of Queen Victoria – the widespread circulation of her image, the naming of institutions after her, the production of stories and poems about her, the construction of statues and busts, the grand ceremonies on her anniversaries – was one of the means through which an Imperial imagined community was knitted. She was the first “media monarch,” a great beneficiary of the age of mechanical reproduction whose circulating representations kept the monarchy socially potent long after its political power had gone into terminal decline, an effect that was particularly important in the colonies. It’s worth noting that the symbols connected to “Victoria” did not always have an unambiguous meaning, and could also be used by colonial subjects to assert their distinctive identities and even to criticize Imperial practices; Plunkett has some fascinating quotes from Indian nationalists who “appropriated” the matriarchal discourse surrounding Victoria’s feminine virtues to criticize British imperialism and its martial values.1 But in this case the choice of “Victoria” for the University’s name did serve as a symbolic link to the empire. Today there are hardly any reminders of Queen Victoria at the University. There is one statue of her, tucked away underneath the stairs at the Hunter building; but it dates from the 1990s (see my photo below), and like many such statues, it has long since faded into invisibility. (I did not even remember it existed until I watched the VC’s presentation; this is a classic example of those “monuments without viewers” that Paul Veyne talks about). The name “Victoria” for the University no longer commemorates a distant Queen, or points to the Imperial community. When students or staff at the University talk affectionately about “Vic”, the name is merely an anchor for all the stories connected to the place; its everyday usage no more implies a reference to a 19th century monarch any more than the name “Chicago” implies a reference to wild onions today, or “Wellington” to the Duke of Wellington for that matter. To change this particular part of the University’s name after 121 years thus seems to me then to devalue important parts of many people’s identities – the parts tied to the stories they tell about themselves in the places they’ve inhabited. I’m not saying that the University’s name is a crucial part of its identity – all institutions change constantly while retaining their general character – but it is well enough connected to its members’ identities (many live and work, and have lived and worked, “at Vic”) that changing it without a sufficient reason violates the idea of “accepting the given, of valuing the valuable, and of valuing the valued”. Perhaps a name change might be ok if it could be shown to produce large benefits, or if it were necessary to wipe away the offensiveness of the colonial past. Cohen himself suggests that the sort of conservatism he defends is only a kind of “bias”, defeasible if we can show that much greater value would be produced by change (even if one would still regret such change), or if change were necessary to rectify injustice. And one could add here Michael Oakeshott’s impeccably conservative idea that sometimes change is justified as the “pursuit of an intimation,” the development of a seed that is “already there.” But none of these reasons seem to me to apply here. The case for renaming assumes that the University’s name recognition will improve following a name change, especially in those markets (primarily Asian) where Victoria is trying to recruit students, and the VC is betting that a name change will (eventually) lead to our rise in international rankings, with all its attendant possibilities for increased revenues and academic recruitment. The VC has assembled data showing that people outside New Zealand do sometimes confuse Vic with other universities, and consulted with branding experts who suggest that the best University names consist of two words, one of which must be “University” and the other the name of the place where the University is located. He also points out that Victoria University of Manchester changed its name to “University of Manchester” without apparent ill effects. Support from the Mayor and other city worthies seems to suggest that it’s now time for the name change; the seed is already there. All of the listed costs of Victoria’s name, and all of the claimed benefits of changing it, seem to me to be nebulous and uncertain. A quick trawl through the marketing literature on corporate name changes and corporate rebranding does not suggest that there are many clear prestige or financial benefits to renaming; on the contrary, folk wisdom in the field seems to be that companies should nurture their names and brands unless they are somehow tainted. From my admittedly superficial scan of a number of these papers (and remember I’m not in this field! ), the most one could say is that “renaming” seems to work best in conjunction with other organizational changes, and that successful rebrandings tend to be expensive affairs. In any case, a substantial number of corporate rebrandings seem to be ways for the organization to distance itself from bad publicity or scandal; a notorious example is Blackwater, ridiculously renamed Xe Services in 2009 and then the even more ridiculous Academi in 2011 to try to escape association with the company’s unsavory role in the Iraq war. (This didn’t work too well; many people still refer to “Blackwater”). None of this applies in the Victoria case. The best case scenario for renaming, that of Victoria University of Manchester, is perhaps less applicable to Vic’s case than meets the eye. There the University was renamed following a merger with the University of Manchester Institute of Science and Technology, which fits in well with the marketing literature’s advice that renaming works best after major reorganizations. Moreover, it appears that Victoria University of Manchester was already known locally as the University of Manchester; so the seed for renaming was there (no “Vic” to contend with). This would have justified its renaming as “the pursuit of an intimation.” None of this is the case for Vic; as far as I know, there was no great dissatisfaction with the University’s name (and various nicknames) among those people most connected with the institution, namely, its current students, alumni, and staff. In politics and academia, the other renaming practices I’m most familiar with usually come in two varieties, which we might call “patronage” renaming and “revolutionary” renaming. Patronage renaming involves changing the name of an institution to please a patron or a donor; see, e.g, the Soviet examples discussed here, or, for a more recent academic example, the renaming of the School of Law at George Mason University after Antonin Scalia. Revolutionary renaming is the act of changing the name of an institution to honour new leaders or erase the hated past; a classic example is the renaming of Petrograd to Leningrad, or Tsaritsyn to Stalingrad to Volgograd. But the same impulse not to honour a hated past exists at a smaller scale and in academic contexts; witness the discussion about the renaming of Calhoun College at Yale. Patronage renaming is clearly inapplicable here; the University is not being renamed in gratitude to a specific donor. But one could perhaps make the case for a “revolutionary” renaming of Vic, breaking its connection with a colonial past that is not cherished by Māori, among others. In principle, I don’t think this is wrong. All politics is at least 60% symbolic politics. (I’m willing to go higher with this number, but let’s be conservative). But I don’t think this applies to the case at hand either; nobody seems to be making the case that the name Victoria is a symbol of a hated past that should not be honoured. In any case, as I noted above, by now the name mostly refers to itself – the accumulation of stories and people associated with, and indeed constituting, the institution – not to Queen Victoria. I am not opposed to attempting to increase the prestige of the University; all things considered, it’s nicer to work at a more prestigious institution. My colleagues do this by producing excellent research, doing great teaching, and engaging with the public in a wide variety of ways; and the leadership team does it too by securing resources and managing them well. But the benefits of changing the institution’s name seem to me to be likely to be too small (how many spots in the QS rankings?) and uncertain (especially when we think about the length of the transition period) to defeat a conservative bias. One problem I’ve been concerned with in recent times is the question of charisma in politics. What does it mean to say that a leader is “charismatic”? And how does charisma matter in politics? Most people, I suspect, conceptualize charisma as an attribute of persons. A leader is charismatic if they have a special talent for the mobilization of others. This talent is, furthermore, described in terms of (irrational) persuasion: the leader can tell just the right stories, and use just the right symbols, to emotionally bind others to him, regardless of the actual merits of what he proposes. Charisma is thus sometimes likened to a kind of magical power: the truly charismatic leader keeps his followers “spellbound,” and can therefore ask of them sacrifices that go beyond what material incentives or threats could achieve, or that seem to actively work against their interests. This talent for “spellbinding” may be partly inborn – some kind of personal magnetism that cannot be taught – and partly a matter of technique, showmanship, PR, whatever you want to call it. (There are even self-help books on how to become charismatic). But whatever its roots, its possessor convinces others to follow and obey them not (just) because of the rational power of their arguments or their ability to command material resources with which to reward or punish, but because of their capacity to emotionally “connect” with them. I think some people do possess a talent along these lines. For example, the late Hugo Chávez, whatever may be said against him, certainly happened to have the knack for emotional mobilization in large-scale settings, while his successor Maduro appears to lack this talent, despite slavishly imitating many of his mentor’s mannerisms. Many other “populist” leaders and demagogues – of the left and the right – have had it. And there is something to the idea that charisma has to do with the ability to persuade others, though its effectiveness may be tied to highly contingent situational factors. (People who are effectively charismatic for some are simply boorish for others). I’m sure many of us know people who have this kind of “performative” talent for connecting with some groups. Charisma in this sense does not necessarily depend on a talent for demagogic oratory. Not every “charismatic” leader fits the image of the great dictator riling up a crowd, and some can inspire extraordinary devotion without ever giving a public speech. This is “backstage” charisma instead of “frontstage” charisma, to use Randall Collins’ terminology. And while “frontstage” charisma is the one we are most likely to associate with the idea of the charismatic political leader, backstage charisma can be powerful too. As a man of intrigue, Yrigoyen developed a secretive, molelike style for which no precedent seems available. He was soon known as “The Peludo,” after a burrowing species of armadillo whose underground life resembled Yrigoyen’s. He gave no speeches. His entire history before he became president in 1916 reveals only one public talk, and that was a very short one given at a very early stage in his career. For many years no pictures of him were available. He talked with many followers, but always with one at a time, meeting the solitary coworker in a small, darkened office and consulting with him in hushed tones. Even at a political convention he would not make an appearance, but would direct events from a tiny, hidden office nearby. He lived in Spartan obscurity in a small house as badly in need of refurbishing as was his meager wardrobe of rumpled clothing, it being his habit to give away the suits he was not wearing, which in any case had been tailored in the style of twenty years before. Yrigoyen had developed a performative talent that kept some of those who interacted with him “spellbound”, even though this talent did not help him give public speeches. Yet this talent does not fully explain why he (and many other leaders) inspired extraordinary devotion at some times and not others. And because both frontstage and backstage charisma depend on recurring face to face interaction rituals to work their magic, such talents can hardly explain the importance of charisma for politics in large and complex societies where participation in public rituals is mostly optional. And indeed Yrigoyen’s “charismatic” persona did not survive contact with the Argentine presidency. Instead of looking at charisma as a talent a person has, let’s take a cue from Max Weber (who first popularized the concept as a tool of sociological analysis) and think about charisma as a form of authority others attribute to a person. Roughly, for Weber, the charismatic leader is simply the leader who is believed by their followers to have charisma, i.e., some extraordinary talent or power relevant to the (existentially threatening) problems of the group, and which therefore justifies complete submission to their authority. The apparent tautology here indicates that the source of a charismatic leader’s hold over a group is not so much the presence or absence of some specific talent capable of compelling others to follow them (as Weber stresses, actual instances of charismatic leadership stem from vary different sources: prowess in war, persuasive speech, prophetic vision, etc. ), but the act of “free” recognition by others of the leader’s unbounded personal authority. Insofar as enough people believe a particular person is the possessor of an extraordinary “gift of grace” (=“charisma”), they are willing to trust their decisions completely and follow them without hesitation. Charisma is thus primarily a pathology of collective trust: a leader is charismatic when they have followers who trust them so fully to do what is right for them, for whatever reason, that they submit themselves to their authority without reservations. This idea is in keeping with the theological roots of the concept as the “gift of grace”. At the extreme, charismatic authority is simply personalized sacred authority, and submission to it entails complete faith in the providential wisdom of the leader. The followers may not fully understand the leader’s plan or vision, but they trust completely that the plan will work out for the best, and are not necessarily fazed by apparent setbacks, because the leader is seen as “anointed” by god. This of course makes charismatic or quasi-charismatic authority resistant to refutation or argument (witness the kinds of justifications followers provide for their hardships under a charismatic leader’s rule); since the leader is thought to have extraordinary gifts, then there is always a reason for what they do. In Stalin’s time, people would sometimes say that “if Comrade Stalin made the decision, it means there was no alternative” in response to apparently harmful and incomprehensible policy changes; for these people – not everyone – Stalin had a kind of charismatic authority. The “charismatic bond” between leader and followers is not in practice unbreakable, however. Weber rightly stressed that charismatic leaders need real successes, or else their followers eventually abandon them. To paraphrase Renan, charisma is a daily plebiscite. A sufficient accumulation of failures (or one big failure) may lead to a complete loss of faith in the leader. (Contemporary social theory speaks of “success charisma” as opposed to “frontstage” or “backstage” charisma). But in the ideal-typical case the leader’s charismatic authority should be strong enough to withstand a lot of setbacks. We might say that a leader has charismatic authority when the followers develop an extremely strong “prior” that the leader will act in their interests. One could then speak of a continuous space here, with charismatic authority at one end and purely “contractual” authority at the other end, depending on both the strength of this prior and the decisionmaking contexts where it is relevant. The greater the strength of the prior, the more charismatic the bond between leader and followers; and the more extensive the decisionmaking contexts where the prior applies, the greater the scope of this charismatic authority. And of course the stronger the prior, the more the leader can withstand setbacks before losing their authority. The person who says to a group experiencing a social crisis, “I alone can fix it”, and is strongly believed by enough of them, has made a successful charismatic claim to authority. Sociologically speaking, then, the important question is what makes such claims credible – indeed, what makes them likely to produce such strong beliefs in the providential authority of the leader that the followers are willing to forgive them all kinds of failures and overlook otherwise disqualifying traits. Here Weber pointed to social factors (situations of severe crisis) rather than performative talents for emotional connection or persuasion. In the typical “charismatic situation”, existing leaders of a group (“insiders”) suffer a catastrophic loss of credibility due to a severe social, political, or symbolic crisis. The group’s status is declining, or its material prospects are worsening, in ways perceived to be existentially threatening. Insiders are believed to be responsible for this condition, and hence cannot command sufficient support for their proposed solutions. Yet decisive action may seem inescapable and urgent: something must be done! I may prefer my view about what should be done to that of others, but the appropriate course of action is highly uncertain, and I may be willing to gamble on decisive action by anyone who can command sufficient support to actually coordinate people’s responses. (Functionally speaking, leaders are mostly coordination devices). Among the “outsiders” peddling solutions to the crisis some exceed expectations in initially gathering support or ameliorating the situation. Perhaps they win elections that few others thought they would, or help make members of the group feel better by violating norms that lowered their status, or maybe even preside over improvements in the group’s material situation. This reduces further the credibility of insider “models” of the crisis while increasing the credibility of the outsider’s views. Moreover, these early successes in turn lead them to gather more supporters (nothing succeeds like success), which makes it possible for them to achieve further apparent successes. Social proof helps here: the more others connected to you support a particular leader, the more it looks like they are succeeding, and the more it seems that you should support them too. (And the more others connected to you participate in rituals of support that amplify emotional connections, the more likely you are too). After a while, the outsider may acquire a reputation as a miracle worker, at least among members of a particular group, and may accumulate a capital of credibility large enough to tide them over some lean periods before their incompetence or hubris betrays them. From this point of view, the emergence of charismatic or quasi-charismatic leaders can look like a broadly rational process of belief adjustment. (Someone with the right skills may even be able to write down a more formal model of the Bayesian updating going on here). The period after World War I in Europe is the key example of such a “charismatic situation”, when a number of people made charismatic claims more or less successfully. The most famous of these people was Hitler, in Ian Kershaw’s classic interpretation. If we conceptualize charisma merely as a sort of talent, Hitler was an unlikely candidate for leadership. Not to put too fine a point on it, he was a loser. To be sure, he did have some qualities, including “massive overconfidence”, that would help him later in his rise to power, and he was well-served by the fascist genius for ritual spectacle; but none of these qualities, by themselves, explain his later charismatic authority over millions of people. (At best, they would have made him a moderately successful rabble-rouser – what he in fact was in the early 1920s). What really invested him with charismatic authority among many Germans in the 1930s were his successes, including his unlikely electoral gains, his astonishing diplomatic and military victories after he gained power, and perhaps most of all the taming of German unemployment. It did not matter much whether some of these successes were actually attributable to Hitler, or based on illusory assessments, so long as he was visibly associated with them. And because Hitler wildly exceeded initial expectations (he was, after all, a perfect outsider), too many people adjusted their priors “too much” in the direction of “miracle worker.” But by the same token, when his decisions led to a massive failure that he had to take responsibility for (in particular, the defeat at Stalingrad) his charismatic authority started to ebb. (It had to be a massive failure, by the way: minor failures would not have dented his reputation much, as they would have been easily rationalized). Similar stories could be told for other classic cases of charismatic leadership in this period. A common thread in these stories seems to be that leaders who are later said to be charismatic are successful bluffers, outsiders who make unlikely gambles and win. Mussolini with his “March on Rome” is another case in point. The march represented no big threat to the Italian state (Prime Minister Luigi Facta was ready to impose martial law to prevent it, and would likely have succeeded), yet king Vitorio Emmanuele III folded and gave Mussolini the prime ministership. This success was one event that helped construct Mussolini’s charismatic authority, complementing the ritual dimensions of fascist rule. Fascist spectacle by itself was insufficient; Mussolini, another paradigmatic outsider, required unlikely, striking successes for large numbers of people to greatly increase their trust in him as a leader. But again, when he failed, his charisma quickly ebbed, and he came to depend more and more on the legal authority of the state rather than on his personal authority as a charismatic leader. Because charismatic authority emerges from the trust of the followers in the leader, it can also be analyzed as a form of representation. The followers believe, very strongly and for whatever reason (and often wrongly! ), that the leader will pursue their interests or promote their values; but if he fails in sufficiently spectacular ways, they may abandon him. In this sense charismatic authority appears quasi-democratic, since it is “freely” given by the followers, who recognize something in the leader that they think makes him likely to represent them, and who can hold him to account (by deserting him) if he does not do so. (Of course, a formerly charismatic leader may come to control other sources of authority, so “exit” may be harder than it sounds. But this problem concerns the fungibility of authority – its potential transformation into other sources of power – not the voluntary nature of the charismatic relationship). Charismatic representation is like a pathological version of the trustee model of representation, where the “constituents” (the followers or the “base”) implicitly trust the leader to a much greater extent than is wise. To be sure, charismatic representation does not depend on fixed constituencies or on institutionalized selection procedures. Only those who flock to the charismatic leader feel genuinely represented; the rest do not. And there is something arbitrary about the way in which followers authorize their representation by “seeing” some implausible gift in a person that supposedly qualifies them to promote the group’s identity, values, and interests. But charismatic relationships still retain many of the characteristics of more institutionalized representative relationships. We find similar language in Chavismo (see, e.g, the “Yo soy Chávez” phenomenon). It was common in both scholarly and journalistic accounts to link Chávez’ success with his personal (“charismatic”) ability to “represent” the excluded, the poor, etc. And we find it also in the justifications of the charismatic leadership of Lenin or Stalin, where the charismatic leader represents the proletariat, for example. The point of these examples is simply that followers in a charismatic relationship understand it as a particular kind of representation of themselves – a form of representation that, unfortunately, often feels more intense and authentic than institutional forms of representation. Leaders described as charismatic are sometimes very different demographically from their followers. And so people sometimes wonder how others can identify strongly with leaders who don’t look like them, or don’t share any of their life experiences. I think the word “identification” may be misleading here: the leader who can credibly channel or mirror the group’s desires and aspirations is engaging in a kind of representation, and can therefore command the trust of the group. If the degree of trust is large enough, the resulting relationship looks like strong identification. But charismatic representation is not “descriptive”, since by definition the charismatic leader has some extraordinary gift that exalts them above their followers; it is the recognition of this “gift” that matters, not whatever apparent similarities there may be between leader and followers. Charismatic representation, like institutional representation, also has its communicative rituals. Descriptions of charismatic leadership tend to emphasize the communion of leader and “people” in large-scale rituals where the followers communicate with the leader as well as vice-versa. The followers shout out questions or encouragement, the leader answers; it isn’t all passive. One sees this in descriptions of meetings with Chávez (who took this one step further with his “Alo Presidente” show), or Perón (there’s the famous rally at the Plaza de Mayo of 17 October 1945, described by Crassweller as a sort of “dialogue” and “town meeting”), or Mussolini (who followed in the footsteps of D’Annunzio). This is of course a fiction; no genuine two-way communication can exist in mass rituals, and the “questions” in such situations are typically softballs. But there can be a feeling of communication that cements the representative bond, even where the followers’ views have no any real impact on the leader; and a good charismatic leader can “read” a crowd well enough to understand the forces he must channel. (This is connected with the idea of charisma as a specific talent). Charismatic leadership claims are more likely to occur when institutional representation appears to be failing. 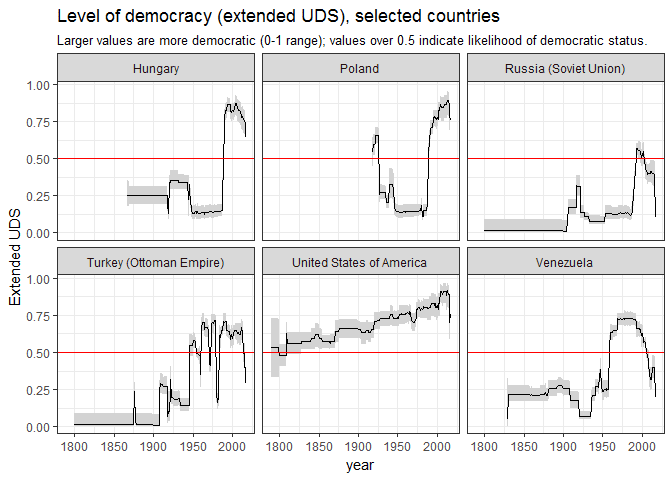 This was clear to observers of the interwar period, when charismatic leaders benefited from a “crisis of representation”, with deadlocked parliaments and fragile coalitions seemingly unable to act in the public interest; and to observers of say, 1990s Venezuela, who also attributed the rise of Chávez to unresponsive and unrepresentative parties there. Concerns about poor representation are a common theme in the “charismatic situations” of the 20th century. Conversely, wherever most people feel institutional procedures for representation work well enough, charismatic claims are unlikely to be made, or to be successful. So there’s a clear sense in which charismatic representation is opposed to institutionalized representative government – “democracy” in the familiar sense of the term. But the opposition between charismatic leadership and institutions goes deeper. As Weber saw, all genuinely charismatic leadership is destructive of institutions, opposing the personal authority of the “prophet” or “warlord” to the institutional authority of the existing order, whatever that order may be. The characteristic pronouncement of the charismatic leader is “you have heard … but I say unto you”; in its purest form charismatic authority is thus revolutionary. One could give Weber’s point an Arendtian gloss and say that while other forms of authority (law and tradition) reproduce themselves, strangling the spontaneity of human action, the charismatic leader breaks through the routine of everyday politics, seeming to promise “new modes and orders”. Because the leader’s followers ex hypothesi trust him to an extreme degree, he can often overcome the authority of existing norms and institutions, whether simply to destroy them or to replace them with new ones. And yet Weber was uncommonly sanguine about charismatic or quasi-charismatic leadership in democracies. (I make this case in more scholarly detail in chapter 18 here – ungated version here). 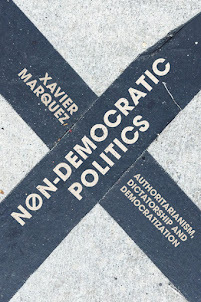 Modern democracy, with its emphasis on what Weber did not hesitate to call “demagogic” mass persuasion and its plebiscitary aspects, is fertile ground for the emergence of charismatic and quasi-charismatic leaders. In his view, modern democratic politics structurally selects for people capable of emotionally “bonding” with the electorate; demagogy and charismatic appeals are baked into the cake of modern representative government. (Weber’s opinion of the electorate’s intellectual capacities was very low). But that’s not necessarily a bad thing for him! The personal authority of the demagogic leader seems to Weber to be the only way to break through what he saw as the bureaucratization and ossification of modern social life. Only charismatic leaders – people who are freely recognized as such by many others, not simply people with particular performative talents – are able to genuinely articulate resonant visions of public values and interests. (He does not give much thought to the alternative where collective bodies or parties embody this charismatic appeal; for him parties are essentially selection institutions for leaders). A charismatic leader is no mere mirror of a group’s desires; they “represent” (my word, not Weber’s) particular causes, not just the immediate interests of a group, and they are able to fight for these causes fiercely in the political arena. Weber’s ideal leaders have a vocation or a “calling” for politics, and are not just in search of empty popularity. The idea that one ought to support democratic politics because it selects for genuinely charismatic leaders with a calling for politics better than other political systems is a bit of a “pact with the devil”, to use another Weberian phrase. Democratic contests do not necessarily distinguish between Cleon and Pericles, and of course charismatic leadership didn’t exactly turn out well in the Weimar Germany of Weber’s time. (Though he didn’t live to see the whole story; he died in 1920). Weber’s view also depends on the ultimate effectiveness of institutional accountability, not just on the possibility of exit from a charismatic relationship. When constrained by electoral institutions, Weber thought that the quasi-charismatic demagogue leader cannot escape responsibility. But there’s something paradoxical in his search for a “responsible” charismatic demagogue. After all, charismatic authority is often too strong for the rule of law; it can erode and destroy even basic accountability institutions. Nevertheless, I think Weber provides probably the most powerful account of the inescapability and importance of charisma in modern democratic politics. It is a double-edged case, yet not so easily dismissed. 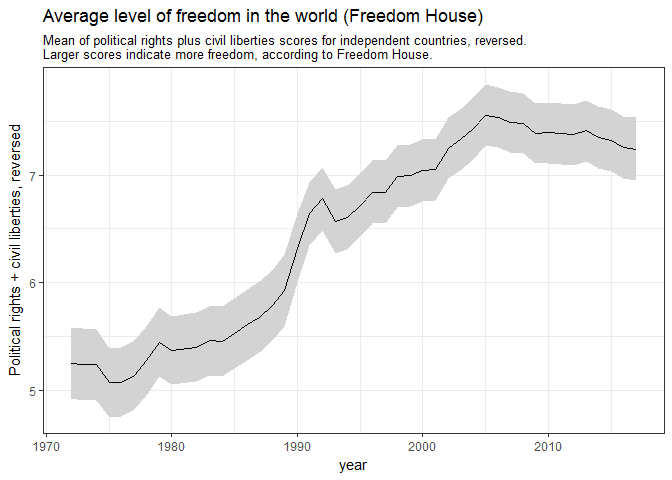 Quick announcement: I’ve just updated my democracyData and QuickUDS R packages (described in this post at more length) to incorporate the latest data from Freedom House (Freedom in the World 2018) and most recent update of the voice and accountability index from the Worldwide Governance Indicators. 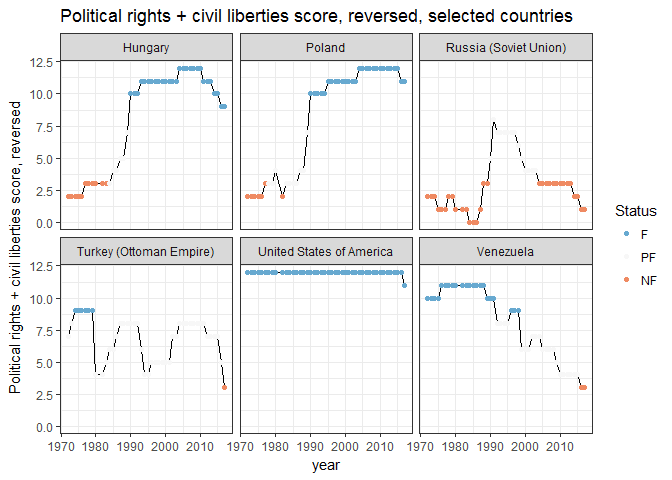 The democracyData package (https://xmarquez.github.io/democracyData/) allows you to download, tidy, and use a wide variety of datasets with regime and democracy indicators, while the QuickUDS package (https://xmarquez.github.io/QuickUDS/) facilitates the construction of Unified Democracy Scores-style latent variable indexes of democracy. 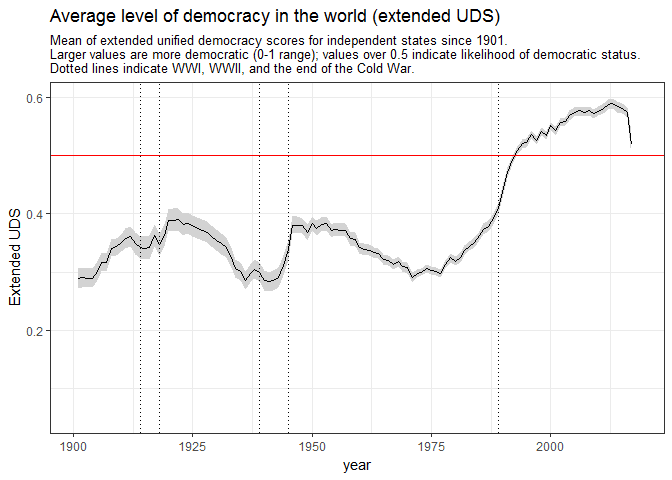 Not so much evidence of a democratic recession, but some evidence of stagnation. 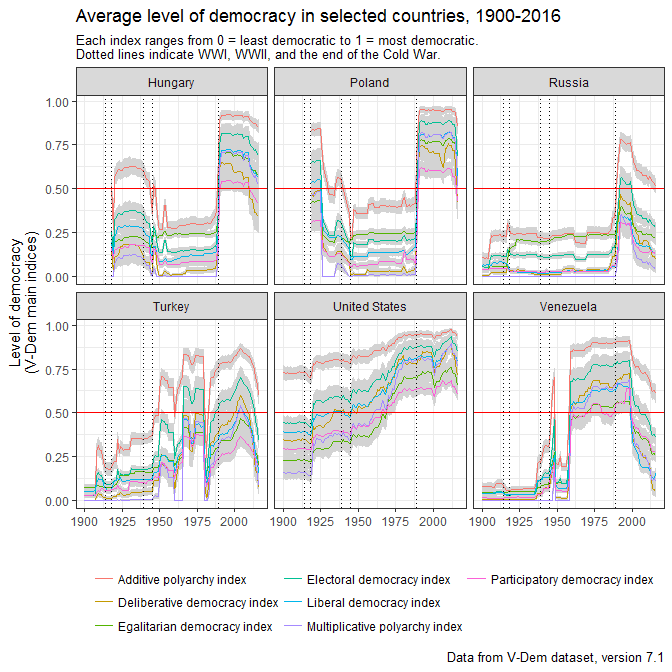 This measure shows a bit more evidence of a decline in the average level of democracy in the world over the past few years, at least according to the indices commonly used by political scientists. 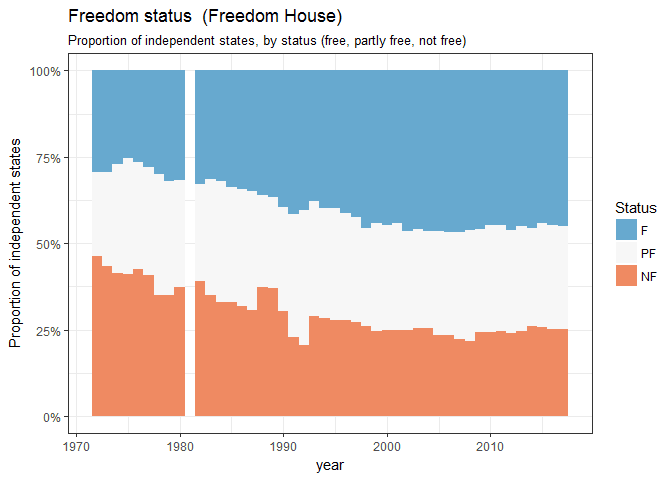 This may be simply because only REIGN and Freedom House have data for 2017 so far, so best not to take that dip for 2017 too seriously. 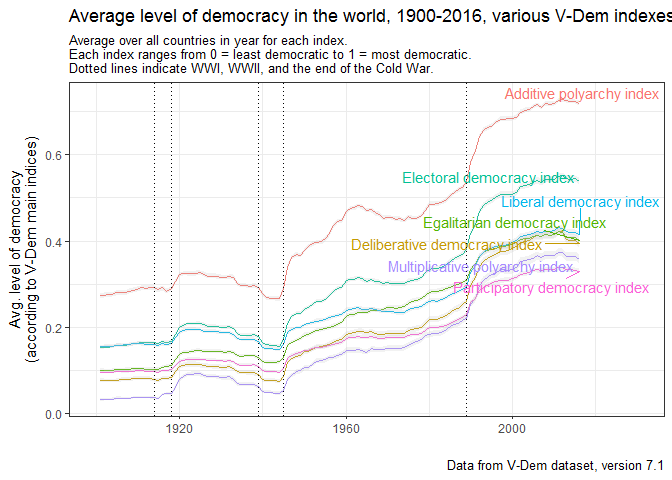 Here there is only a hint of a downturn in the average level of democracy in the world (but note V-Dem has not yet been updated with 2017 data). (Of historical interest mostly, though I think it’s a good story). Most people reading this blog probably know about Trofim Lysenko, who, with Stalin’s help, set back Soviet genetics in the late 1940s, preventing any discussion of Mendelian inheritance. Yet Stalin’s influence on Soviet scholarship after WWII was much more far reaching. He intervened in disputes concerning philosophy, physics, physiology, linguistics, and political economy; in fact one of the epithets by which he was sometimes referred in the press was “the coryphaeus of science”, i.e., the leader of the chorus of Soviet science. (Lysenko himself used the term in his eulogy for Stalin in 1953, though it was first used in 1939). Most of these interventions were editorial in character. He edited pre-publication drafts of articles and books, often in close consultation with their authors and at great length (he was actually a decent editor), and occasionally provided feedback on published and unpublished work. And he did this despite the fact that he was the undisputed ruler of one of the victors of World War II, a country that was facing the gigantic task of reconstruction after one of the most destructive conflicts in human history. In short, he was the editor and reviewer from hell. The story of Stalin’s intervention into Soviet linguistics is particularly funny, at least in the morbid way that anything from that time can be funny. And it also brings out some interesting points about how official ideological commitments both constrained and enabled Stalin and Stalinism. Some context here. In the late 1940s, the Soviet government set in motion a number of campaigns to reduce “foreign” influence on Soviet science. Some of these campaigns involved harassing scholars who cited too many foreign scientists or wrote in English too much, while others attempted to stress the distinctiveness of socialist science. In linguistics, the standard socialist position was represented by the work of N. Ia. Marr, who had argued in the 1920s that class struggle explained the development of language. Marr, like Pavlov, had been pretty much canonized by the Soviet academic establishment, so nobody bothered to attack his views, despite the fact that they had some obvious weaknesses, and Marr wasn’t around to defend them. In any case, one would think Marr’s view was sufficiently socialist – sufficiently Soviet – to be safe from attack. The charge of “rootless cosmopolitanism” is notable; this is just before the high tide of Stalinist anti-semitism. But Chikovaba (via Charkviani) is also clearly pointing to some obvious problems with Marr’s views, and the overall thrust of the criticism suggests a way of reconciling the universalism of Marxism with Stalin’s conviction of the importance of national cultures. And Stalin is clearly looking for a way to shake up Soviet linguistics in this direction, and is thus receptive to these criticisms of Marr. In any case, Stalin is sufficiently impressed with the letter that he summons both Georgians to his dacha to discuss the matter. (Think how unusual this is – among his many duties, Stalin believes it’s important to discuss the correct Marxist-Leninist position on the development of language!). The discussion goes well, and Stalin asks Chikovaba to write an article for Pravda, a draft of which Stalin edits “line by line, at times eliminating or adding words, sentences, or paragraphs”, and stressing in his comments that “languages were national in character, not class-based.” Revise and resubmit! Chikovaba sends another draft a few days later (nothing like having Stalin as your editor and reviewer to put the fire in your belly) which Stalin again discusses with him extensively and finally approves for publication, sending a note to the Politburo saying that there should be a “free discussion” of linguistic issues. No disinclination to retract one’s findings here! Stalin’s intervention posed new problems, however, since it seemed to contradict things he had said in the 1930s. So people wrote letters asking for guidance: how do you reconcile the contradictions between Stalin’s “cosmopolitan” position then and his “national” position now? Is it ok to speak or learn Esperanto? What about foreign loan-words? And Stalin (and the newly empowered anti-Marrist faction) either had to answer or to ignore these questions – some of which raised even more complicated issues about the relationship between science and the class structure. But, as Pollock notes, “there was no accepted method of continuing discussion after the time for official discussion had concluded. Stalin’s decisive role only deepened the quagmire” (p. 282) by pre-emptively establishing a new orthodoxy. Yet Pollock makes a good case that Stalin really wanted some genuine discussion and criticism as a way of furthering the progress of science, at least in some fields (though he underplays the connection of Stalin’s views on linguistics with his interest in strengthening national identities and making use of patriotic fervor), and goes on to make the more (speculative) claim that Stalin’s repeated assurances that science only progresses via discussion, and that it is not necessarily class-based, account at least in part for “science’s rising prestige in the post-Stalin decades”. Stalin really needed (some) science to work well in the coming competition of the Cold War, and dimly understood that this could not happen if dogmatism reigned everywhere. Yet as long as he was alive, no such discussion could take place. His influence was like that of an enormous gravitational body; once he intervened (or was even suspected of intervening), the space of discussion became completely warped. Dogmatism was safety: one needed to know where to stand in order to get on with life. Wherever the orthodoxy was unclear, best not to tread. I have piece at the Monkey Cage on what flattery in authoritarian regimes might say about flattery in the Trump administration. There is probably nothing there that is not already very familiar to long-term readers of this blog, but it may still be of interest. A couple of notes. The piece references (via link) an article by Victor Shih, “‘Nauseating’ Displays of Loyalty: Monitoring the Factional Bargain through Ideological Campaigns” which I discussed here years ago. It’s a fun paper! It was a general strategy of regional officials to cultivate the veneration of a leader from Moscow’s party elite. Each region tried to recruit a patron of its own from the height of the pyramid of power. […] The local Party elite in Novosibirsk attempted to enlist Kuibyshev as a mentor of his former place of exile – a project that was unsuccessful because of Kuibyshev’s early death in 1935. Regions tried to monopolize and “colonize” certain members of the Moscow power elite, to whom they could afterwards turn by referring to their “special” relationship to the region. This claim emanated from the regional elite and was tolerated, perhaps even greeted, but not initiated by the cult objects themselves (p. 200). This was sometimes a matter of life or death. A local party committee in Voronezh tried to get Kaganovich to come to a festival in his honour “in a desperate attempt to bolster its position within the regional Party hierarchy”, which was at risk in the terror. (Many of the members of the committee were historians, whose “object of study … was in a state of constant rewriting” at the time). One problem people ran into was that many of those who were honoured in the early 1930s fell from grace in the terror. So after the first renaming, there was another counter-wave of “renaming streets, buildings, and institutions. This wave erased the “enemies of the people” from the country’s map” (p. 205), and also reduced the number of “usable” leaders, diminishing the utility of such practices for securing patronage. The other account, by Nikolai Ssorin-Chaikov and Olga Sosnina, looks at gifts to Soviet leaders. The main thing they note is that these gifts were understood as part of a sort of “moral economy” of (indirect) reciprocity. Factory groups, party committees, and the like produced gifts partly as “reciprocation” for the “gift” of socialism, but also for more concrete resources – and perhaps, in some cases (it’s hard to tell for sure) in the expectation of reciprocation by the object of the gift. (Of course, people didn’t necessarily think of these gift-giving rituals as explicitly asking for anything; that’s not how gift-giving works). These gifts were quite various, and sometimes bizarre. Gigantic rugs or porcelain vases with the image of Stalin, “a grain of rice with the portrait of Stalin”, models of rockets or tractors, “a miner’s pickaxe made of silver and rare sorts of wood”: these were not meant to be used, but to foreground the gift-giver (the institution, usually) who made them, and to reaffirm their place within the Soviet order. Gift-giving is a common aspect of political flattery; and it often attempts to put the gift-giver in as good a light as the recipient. There was a bit more activity on this blog than last year, though still very little (only 5 posts); my New Year’s resolution is to write more. In any case, I especially enjoyed writing on Utopia and Revolution and reading KCNA’s headlines as literature. I also wrote a couple of R packages that I hope are useful to others. Offline, I managed to edit a volume on “democratic moments” in political thought. Unlike many such collections, this one (forthcoming in February 2018) will also be freely available online (under a Creative Commons license), though of course you can always buy a physical copy. Thank you readers! This year, I read fewer books than I had hoped. There was a fair amount on the Russian Revolution; beyond Richard Stites’ fantastic Revolutionary Dreams, I also recently picked up Yury Slezkine’s The House of Government which is so far excellent (but will take me a while to get through, at over 1000 pages), and Vasily Grossman’s Life and Fate, perhaps the most important Russian novel of WWII. I also visited Beijing for the first time in my life (exceedingly interesting! ), which led me to pick up some books on Chinese history (many via recommendations from Razib Khan); so far, I’ve really liked Timothy Brooks’ The Troubled Empire, and I’m currently finishing Jonathan Spence’s The Search for Modern China, which I have found useful. Seva Gunitsky’s Aftershocks was excellent; it’s in part about how the prestige of power helps drive regime change. I hope to write more about it next year. I also read a lot of sci-fi (I have no taste in literary fiction – for that, look at David Auerbach’s amazing list), but the only things that really stood out were Cixin Liu’s The Three-Body Problem trilogy and Charles Stross’ novels; the Laundry files novels strike me as great “novels of bureaucracy,” in particular. But everybody knows about those, right? Scott Alexander’s reviews of Eichmann in Jerusalem, Surfing Uncertainty, and Seeing Like a State are well worth reading. Lots of Ribbonfarm, including Chris Reid’s Games, Videogames, and the Dionysian Society; Sarah Perry’s Idiots Scaring themselves in the Dark and Feeling the Future; and especially Venkatesh Rao’s How to Make History (which is a really interesting use of Hannah Arendt to think about Silicon Valley). Joseph Heath on Iain M. Banks’ “Culture” novels - an excellent exploration of what a purely “memetic culture” would entail. Mike Travers on eclipses and rituals. Other web pieces worth mentioning (at least, things that stuck in my mind or found interesting): Christian Thorne’s Fulfilling the Fascist Lie (on Adorno’s Authoritarian Personality); Randall Collins’ Faces Around a Dictator; The Sacred Monarchies that survive into the postmodern age; The Conservation of Coercion. There was much more worth sharing, but this is enough for now. Happy new year everyone! The Manchus had their own aristocracy of a kind, formed from the descendants of Nurhaci and other famous warriors, and from the powerful Chinese generals who had submitted early to the rising Qing state. But the Manchus’ ingenious policy held that, within a system of nine aristocratic ranks, a given family dropped one rung on the ladder with each noble incumbent’s death: thus, a title of the third rank would be inherited as a fourth-rank title and then drop to the fifth. Ultimately – unless the emperor repromoted a member for conspicuous merit – the once-noble family would would re-enter the ranks of the commoners. (Jonathan Spence, The Search for Modern China, p. 45). This is clever: automatic family status depreciation acts as an incentive for the younger generation to prove itself in the eyes of the emperor. Spence does not say much how this system actually worked (or even whether it worked at all – was there a lot of status churn or mobility? did some families retain their status generation after generation?) but it’s still an interesting twist on the idea of aristocracy. Are there any other aristocratic societies where this sort of tax on status inheritance has existed? (Mostly a disorganized discussion of Richard Stites’ superb Revolutionary Dreams: Utopian Vision and Experimental Life in the Russian Revolution, by someone who is not a historian. Contains half-baked analogies to current events). I’ve been on a Russian and Soviet History reading binge recently. (The fact that it’s the 100th anniversary of the October revolution is I think coincidental, but it probably helps increase the salience of the subject). Just a couple of months ago I picked up China Miéville’s October, his retelling of the story of the Russian Revolution, which I came across via Sheila Fitzpatrick’s review of several new books on the subject. I wanted to read a sympathetic perspective on the revolution (Miéville is a socialist), and I’ve often enjoyed Miéville’s novels, but I found this particular book flat and lifeless (though many reviews say otherwise, so take this with whatever amount of salt you prefer). Nevertheless, I guess I should thank Miéville’s book for pointing me towards an older work, Richard Stites’ 1989 book Revolutionary Dreams: Utopian Vision and Experimental Life in the Russian Revolution (free pdf via Monoskop). That book was fascinating – a genuinely immersive, extraordinary story of why the Russian revolution was much more than a series of protests and coups. Though Stites’ book is not about the political events of the time – it’s a study of Utopian experiments in Russia and the Soviet Union from the late 19th century to the early 1930s, not a recounting of the seizure of power of 1917 – it really gives you a feel for why people felt they were living through a most revolutionary time. And, despite the obvious and enormous differences in context between Russia in 1917 and today, I found many interesting analogies to current cultural trends, so the book seems worth discussing. (Warning: long). Like all important political terms, the term revolution is contested; we don’t always agree about what counts as a revolution, just as we don’t always agree on what counts as a democracy. And lots of events are conventionally called revolutions, many of which have little impact on world history. But the Russian Revolution, like the French or the American, has a good claim to represent a paradigmatic case of the phenomenon. One could attribute this to the fact that the revolution, like the American or the French, led to the birth of a new form of government – the Leninist one-party state with explicitly socialist commitments, a form which proved enduring (it still lives on in China, where the CPC sees itself as the rightful heir of October) and was attractive to many people for much of the second half of the twentieth century (see Seva Gunitsky’s excellent book Aftershocks for more on this point). But there is more to it than that. Jack Goldstone once mentioned in a review article that great revolutions have a “fractal” quality, where “social order breaks down on multiple scales simultaneously,” from the family to the town to the city to the national government and across many social institutions. I’ve always found this idea quite useful for thinking about what distinguishes a simple revolt (where a normative breakdown is restricted to say, the national government institutions) from a big revolutionary upheaval. It certainly applied to the Russian revolution, where everything – family norms, clothing, architecture and arts, cities and town planning, public monuments, religion – seemed to be up for negotiation simultaneously. (One wonders how much of this was entirely serious, and how much just done for the fun of it). To be sure, much iconoclastic behaviour had little to do with the theories of the revolutionary intelligentsia. For example, peasants throughout Russia burned down manors, broke statues, and “pulveriz[ed] musical instruments” (p. 62), not because they were actuated by a desire to build something entirely new, or in any way interested in avant-garde ideas about the need to destroy the old in order to build the new world, but simply as the rejection of “a way of life repugnantly and bewilderingly different from that of peasants” (p. 63). And the signs They have made. Many young people seem to have been caught up in the exhilaration of the iconoclastic destruction of past culture (not just statues). The deliberate outrageousness of the Russian futurists, in particular, reminds me a bit of the desire of some people today to smash “political correctness” and the nostrums of what had been, until very recently, the “establishment” culture. Mayakovsky was the chief troll, an interesting, accomplished poet who spoke of his desire to point “‘Comrade Mauser’ at the orators of the world, [and to put] Raphael and Rastrelli against the wall” (p. 70), while his colleagues in the futurist movement were sort of the “alt-left” of the time, always a bit more outrageous than the more pragmatic Bolsheviks who actually had to worry about governing. But of course Russian revolutionaries weren’t the only people caught up in the fun of destroying the old (and Stites is good at recognizing that there was some fun in it); the impulse seems to have been pretty common among intellectuals of the early 20th century. Here’s the Italian Marinetti (another futurist poet, and later fascist, in 1909): “We want to demolish museums, libraries, [and for good measure] fight morality, feminism, and all the opportunist and utilitarian cowardice” (p. 70). One of the things that struck me reading Stites was the degree to which iconoclasm was partly driven by a kind of “purity impulse”: the desire to cast out the “pollution” of the old, built on the backs of millions of exploited and unjustly treated anonymous people. This was especially evident in what was called “Makhaevism” (a current of thought identified with Jan Wacław Machajski, where the anti-intellectual impulse to destroy all existing culture was especially strong). For example, Machajski wrote that the masses should “rise up at the first opportunity and destroy and annihilate to the last iota the accursed accumulations of wealth which you have helped to create through the ages and which the masters have always seized entirely for themselves.” His point was not that the wealth and achievements of the past should be transferred to the proletariat, but that they should be destroyed; this was a purely leveling impulse, driven by the thought that the past was polluted by its complicity with injustice, and hence it was better to start from zero. As one of the followers of Machajski put it, “All history in fact … was ‘one endless, uninterrupted chain of violence and fraud’” (p. 74) and hence not worth preserving. I don’t mean to give the impression that these sorts of feelings were widespread. Iconoclastic impulses also met anti-iconoclastic resistance; top Bolsheviks (and many other people) weren’t keen on destroying everything. Beyond destroying major symbols of czarism, they (Lunarcharsky in particular) preferred to preserve the treasures of the past - to open the Russian patrimony to the masses in those museums that the futurists wanted to destroy. But a pervasive distrust of past culture fed nevertheless into anti-intellectual attitudes that would play a recurrent role in the early decades of the Soviet regime, with its distrust of “bourgeois specialists”. In any case, the new, avant-garde alternatives to the culture of the past weren’t always all that popular; despite the best efforts of the futurists and the Proletkult movement, much of the proletariat remained stubbornly attached to more traditional forms of culture and did not show much inclination to want to destroy it completely. For example, though there were a number of conductorless orchestras at the time (like the famous Persimfans, which was actually super cool – one of the more successful experiments of the time in egalitarian organization), they tended to play “Beethoven rather than Schoenberg” as Stites puts it; and though styles of dress changed, few people showed any inclination to follow the more eccentric ideas about appropriately revolutionary dress, like nudism.1 This of course does not mean nothing changed (Stites makes some very good points about, for example, the use of egalitarian language and the changing forms of address during the revolution), and at any rate some utopian ideas had enormous influence even if they were never very popular in their “undiluted” form. One of the more interesting things about the Russian revolution that I learned from this book is the extent to which it was a “science fiction” revolution. This was a revolution were a senior Bolshevik – Bogdanov – wrote a sci-fi novel called Red Star about a communist utopia on Mars (apparently a big influence on Kim Stanley Robinson’s Mars trilogy), and where the “Anarcho-Biocosmists” proposed a plan to launch a social revolution “in interplanetary space but not upon Soviet territory”, apparently seriously (p. 55; this before people had even reached orbit!). 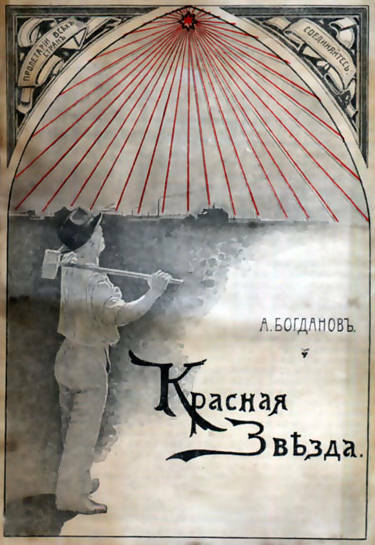 And of course there were also the God-builders (I wrote a bit about them in my post on the Lenin cult here), whose attitude towards science and technology also had science-fictional echoes. Fedorov (1829-1903) … combined certain features of Russian Orthodoxy and tsarist ideology with an extravagant belief in cosmic possibilities. The world of his vision, converted to Orthodoxy under the tsar in Moscow, spoke a single language (recovered from pre-Babel times by a congress of scientific linguists) and lived in rural communes, working in factories in winter and fields in summer. The social bond was faith and fraternity, not materialism or equality, since Fedorov opposed both socialism and capitalism. Each commune was situated around a cemetery with a model of the Moscow Kremlin at the center. The rule of communal life was Psychocracy: mind control, open diaries, public confession and penance, and the regulation of sexuality. Global security was provided by a Godloving Army and a Pacification Fleet. Fedorov’s vague scientific-mystical Utopia was designed for a specific set of tasks which he called “the common mission” of mankind: victory over death, resurrection of all the dead, and the settlement of outer space. The syncretic quality of Fedorov’s dream generated a school of disciples in the Soviet period, loosely know as the Biocosmists, whose slogan was “Immortalism and Interplanetism.” Beyond their study and discussion circles, figures as diverse as Konstantin Tsiolkovsky (the rocket scientist), Leonid Krasin (who designed Lenin’s mausoleum), and V. K. Vernadsky, the earth scientist, were said to have been in Fedorov’s orbit at one time or another. The most consistent of the Fedorovites was Valerian Muraviev, a man with an extraordinarily checkered career even for those times, a fanatical Bolshevik, and a devout Fedorov adept. He combined the ideas of his master with those of Frederick Taylor … The cult of Fedorov in the Russian Revolution, a seemingly impossible idea, illustrates precisely a vagrant mentality that some have chosen to call the “crankish” side of the Revolution but which was really a millenarianism and a utopianism fed by serious erudition of a special sort and by the unbounded Promethean belief in man’s ability to transform nature and reverse its laws (pp. 169-170). You couldn’t make this up. (Incidentally, this clarifies for me some references in Hannu Rajaniemi’s excellent Jean Le Flambeur series of post-singularity novels about the “Great Common Task”). In any case, this sort of thing, funny as it sounds (I find it both horrifying and appealing in about equal parts), is a useful reminder that the impulse to conquer death through technology is not something that was just invented by Silicon Valley rationalists, but an idea with a more complicated history. There’s a line from Fedorov to Thiel and Musk! The German Expressionist writer Ernst Toller, who visited [an institute office] in the 1920s, described a hundred identical gray benches, with a hundred men and women trainees in identical costumes obeying instructions conveyed by electronic beeps of machine. They approached the work benches in columns, performed tests in unison, graduated in difficulty. Their hammer-teacher was a machine to which their arm was strapped until they were able to work independently. A “cyclogram” photographed their work and recorded their progress by means of moving lights. There were no books, no theories, no meetings—only practical work, from simple to complex, in a course lasting three to six months. The purpose: to study “the human machine’ and to create new people by means of social engineering (p. 154; incidentally, Gastev more or less invented the term “social engineering”). Graduates of the institute would go on to train workers elsewhere, combating laziness, apathy, low productivity and the like. (This was no joke – the institute even won major Soviet decorations in the 1920s). Apparently Gastev was warm and engaging, motivated by a vision of social equality (but a transhumanist one, where people would eventually meld with machines), and Stites seems to have a weakness for him. And there is a clear aesthetic dimension to Gasteevism: a “sparkling and kinetic vision of a vast continent unified by steel, electricity, and asphalt, of bright and throbbing machinery glinting in the sunlight as it labored to refashion a world, and of workers trained by industrial metronomes into something resembling a huge and elegant corps de ballet tending that machinery and deriving its graceful precision from it” (p. 155). Stites claims that from the perspective of the 30s, this was a “vision of hope”; he’s not entirely wrong. Workers were seen holding banners bearing Ford’s name in parades along with those of Soviet leaders. Peasants called their tractors fordzonishkas, and deep in a Volga province village, peasants harnessed a wedding cart to a Fordson decked out in red bunting. Some peasants were unable to pronounce the name Ford (calling him Khord instead), but they saw him as a magical persona, asking the journalist Maurice Hindus if he was richer than the tsars and was the most clever American. They longed to gaze upon him personally (pp. 148-149). Advertisement suggesting that ‘A Human Being Is Only Human with a Watch.’” Image number 26 in the book. the Timeists were considered a nuisance by administrators. Komsomols who lived by League principles were often criticized by their comrades as “red-tapeists,” egoists, violators of the collective spirit, and super bureaucrats. Technical, managerial, and government people accused them of dilettantism, excessive and uninformed demands, and of being a menace to competent professionals. In any case, the League was not very successful in realizing Kerzhentsev’s dream: to teach all Soviet citizens “spontaneous self-discipline.” Instead it pitted a legion of enthusiasts and busybodies against uninterested citizens (p. 158). And so they were suddenly dissolved in 1926. But I must admit that I found them endearing, despite the fact that I would almost certainly resent them in practice. There’s something appealing about living an organized, productive life, without wasting time in pointless meetings (the Timeists really hated pointless meetings. I sympathize, having sat through my share of them) or boring speeches. And there’s something sweetly naive (but not altogether wrong) in their embrace of “good time habits” as part of what makes a society productive, and their generally “civilized” methods for fostering such habits contrast favourably with the brutality of the Stalinist labor system in the 1930s (as Stites notes). Since the population was low in literacy, preaching the Godless word directly seemed to hold out great promise for the enthusiasts of enlightening atheism. In 1923 big debates were held in every district of Petrograd. In Vladimir, 2,000 listeners heard a six hour debate between an atheist and a priest on the theme: “Is there a God?” Another in Pereyaslavl lasted two days and was attended by 3000. In both, according to Soviet sources, the priests were defeated and they deserted the cloth. The proletarians of Moscow, in spite of their hostility to religion, jammed the auditoriums to hear speakers like the Archbishop Vvedensky. But the Bolsheviks did not always win these debates. [Maurice] Hindus met a priest who had debated against the Godless, asking his opponent why man, if so powerful, had not invented sunshine, rain, or stars. The answer: nature created them. Question: who made nature? Nature, like a watch or a revolution, had to have a maker. Answer: Nature made itself. Result: public laughter and the victory of the priest. In 1924 “Russia teemed with talk of religion,” debates being for a while the chief outdoor diversion, according to Hindus, a native speaker who visited Russia many times. Atheist preachers hit the circuit like American parsons on the Bible Belt; like them, many were sons of rural folk, in their case armed with scientific miracles and blasphemy. A singularly unimaginative atheist sailor tried to keep the faithful out of church by buttonholeing them at the door and reading to them about isoceles triangles (p. 107). The country was covered with a network of seminars, study groups, evening and correspondence courses, reference points and home-guides such as “Teach Yourself to Be Godless.” Godlessness was a mark of culture among adherents to the regime, and all higher educational institutions included atheist courses. There was even an All-Union Anti-religious University of the Air [I love that name!]. Since the majority of schoolteachers were still religious and since the teaching of atheism in school was not required in the 1920s (although the teaching of religion was forbidden of course), the burden of anti-religious propaganda fell very heavily upon the League [of the Militant Godless] and its supporters. And since the bulk of its themes were couched in rational, historical, and scientific terms, one must wonder at the effectiveness of the anti-religious propaganda network so acclaimed by its organizers and so defamed by its enemies. But one can hardly doubt the zeal and enthusiasm that went into this quasi-missionary crusade against the faith (p. 107). Another movement of the 1920s became – at least for awhile and on a limited scale – a rival “religion of communism.” This was sectarian Christianity. The Sectarians were vibrant in their faith and in their conscious emulation of Bolshevik codes and rituals in order to compete with them, a practice that Bolshevik commentators found both engaging and annoying. Party officials observed that the sects were spiritually vital and attracted converts by their sobriety, mutuality, charity, and joyous song – a combination that Bolshevik Godbuilders dreamed of. The Baptists of Kursk Province attracted followers because of their model behavior, genuine brotherhood, relevance to life, and the unabashed prayers to Jesus in time of joy and woe. Perm Evangelists, copying the Bolshevik parallel feasts, launched a Day of Youth, a Festival of Sisters (for women’s equality), and religious texts set to revolutionary and church melodies. Novgorod Sectarians held concerts full of spontaneous singing and “love evenings” that fused the revolutionary concept of comradeship with Christian motifs of brotherhood in clean, sober and highly organized settings, avoiding both the wild drunkenness of village feasts and the banality of Bolshevik events. Commentators were astonished at the frankly modern and syncretic methods of the Sectarians. Socialist imagery was freely adopted in slogans of justice, solidarity, and equality, in agitprop campaigns to enlist youth, and in organizational names such as Bapsomol (or Baptomol) and Christomol to rival the Komsomol. They held meetings and challenged other religions to friendly competitions. On May Day in Saratov Province, Baptists launched a Day of Classless Solidarity with Brothers in Christ and a two week campaign against biblical illiteracy. Almost every Bolshevik method of reaching the masses was imitated, including sheftsvo. Some Sectarians, grateful to the regime for having lifted the onerous persecution by the Orthodox Church, seemed to want some kind of merger between Bolshevik economic forms and a vibrant sectarian Christianity, infused with brotherhood, equality, and harmony (p. 121). The Sectarians were more successful than the Bolsheviks in arousing genuine emotion and commitment, and their conversion record was impressive. The Bolsheviks wondered why this was so and urged activists to emulate the methods of the sectarian groups. But the secret of the Sectarians’ success was not, of course, the forms of ritual and propaganda. It was their transparent faith and moral power. They preached no hatred against class enemies and opened their doors to people of all ethnic origins, sexes, classes, and nationalities. Their charity was unabashed and unlimited, and most of all uninhibited by ideological and political animosity (p. 121). Because of certain outward features of Bolshevism – and other communist movements of our century – commentators have often called it a religion. In the 1920s, Fueloep-Miller remarked that Bolshevism taught science but was not a science, that it fought religion while being like one. In our time, Jacques Ellul has said, “the Russians have gone furthest in creating a ‘religion’ compatible with Technique.” These judgements are misleading. Maurice Hindus – writing in the 1920s – was more perceptive. Bolshevism, while containing many of the outward attributes of a faith, he observed, was actually a nonfaith because it was not forgiving, possessed no deity, exalted science and nature, and possessed a “revolutionary” system of ethics instead of a humane one. It lacked beauty, dignity, and spirit. Berdyaev in the 1930s emphasized its lack of inward drama and depth, its weakness in religious psychology, and its pedantry. Mao Zedong, a major communist of our time, put it very succinctly and honestly: “Marxism-Leninism has no beauty, nor has it any mystical value. It is only extremely useful” (p. 122). I am less sure about the value of this particular judgment, though some of this is mere semantics. If you think doctrinal content or mystical experience, belief in a deity or a particular ethical orientation, are definitionally part of anything that can count as “religion”, then fine, Bolshevism (and Marxism-Leninism in general) is not one (Godbuilders excepted, perhaps). But if you think, as I do, that strong interaction rituals are more important than specific beliefs for religious practices, it’s harder to deny that many aspects of communist practice were religious, starting with the cults of many communist leaders, as Stites himself sometimes suggests. In any case, a purely aesthetic definition of religion (does it have beauty? Is it humane?) seems less than adequate to the actual variety of religious experience in the world. Stites argues that the Stalin era – starting sometime in the late 20s – was the end of the “utopian moment” in the Russian revolution. While Lenin had been ambivalent about most utopian experiments (and there are many more described in the book than I’ve mentioned even in this very long post – the book is super readable! ), he was not openly hostile to most of them as long as they did not amount to genuine opposition, and in any case the relative pluralism of the NEP period had provided a certain amount of space for lots of crazy ideas. (This space was always precarious, and it had definite limits, but it existed). By contrast, once Stalin had consolidated his position in the late 1920s, he “began an emphatic repudiation of all Utopian currents and humanistic experiments” (p. 225). In Stites’ telling, Stalin was unremittingly hostile to egalitarianism, visionary fantasy, or anything that smacked of utopia. Yet when we consider the perils of utopia, we usually think of the Stalin era as exhibit number one for the prosecution, with the human disasters of collectivization and forced industralization, the introduction of full central planning, and ultimately the endless search for enemies and saboteurs during the Great Terror. In the standard view, Stalinism is what happens when Utopian plans meet human reality. There’s no real contradiction here, of course. Stalinism is the classic example of what James C. Scott called “High Modernism.” It belongs to the family of what Stites calls “administrative utopia”, with its emphasis on order and organization and its rejection of spontaneous and autonomous action; its horrific results came from the fact that it was coercively imposed on a generally unwilling population (especially in the countryside). To be sure, many people adapted the best they could, and some found fulfillment in participating in its grand projects (“make the USSR great”); one only has to read about the creation of Magnitogorsk, for example, described so amazingly in Stephen Kotkin’s Magnetic Mountain to understand some of its appeal. And perhaps one can say that Stalinism was utopian less because of its plans (which were understood by many to be pragmatic steps towards socialism), but because of its hubris, its moral and epistemic self-certainty. But if Stalinism was the classic example of high modernism, perhaps we can call the many utopian experiments that flourished (sometimes precariously, and often not for long) during the first decade of the Russian revolution examples of “low” modernism – modernism from below rather than above. Many of these would probably have had awful effects if scaled up and implemented coercively. (One only has to think of the many urban visions described by Stites, with their lack of privacy, communal kitchens, children raised in separate areas, and omnipresent piped music to recoil in horror). But many remained endearing and interesting as long as they did not attempt to impose themselves on the unwilling, and would not have been out of place in the “framework for utopia” of Nozick’s Anarchy, State, and Utopia. These utopian experiments were also modernisms, founded on the rejection of past, even if a few also drew on older Russian practices (e.g., the egalitarian traditions of the artel). Many were dubious or crazy – from people talking about dressing in paper clothing to experiments with radical models of the family – but I was struck by the optimistic sense of experimentation that pervaded them, and do not feel like there’s much point in condemning people who came up with these ideas or bought into them as naive or deluded. (In any case many of these people would suffer greatly under Stalinism). These were genuine Millian “experiments in living,” and it seems to me a liberal society should very much make space for them. Utopianism is often naive, innocent, and childlike. But what virtue is more admired in the whole catalogue of human art and sensibility than childlike enthusiasm, innocence, and spontaneous love and acceptance? What is more lamented than our loss of youth, romance, openness to change, thirst for adventure, and the absence of refined callousness and cold sense of “reality?” These characteristics of the Utopian imagination appeal to every generation that discovers it; it is the recurring vision and hope for the “good place” even if it is “no place” – for the better world or even for the one world. The warming springtime of human hope does not give in to the wintry smiles of the cynic and the realist; it blossoms and it perishes in the sad autumnal winds. And then it is born again – for ever and ever (p. 253).